Do you remember the days when you were still a young child? In kindergarten or grade school, your teacher may have asked you what kind of places you want to visit. And we’re sure that one of the places you long to set your feet on is the city zoo. Oh yes, there is nothing more enthralling than seeing mighty lions, scary snakes, huge bears, regal eagles, proud giraffes, funny monkeys, and other animals that we read about in storybooks and fairy tales. 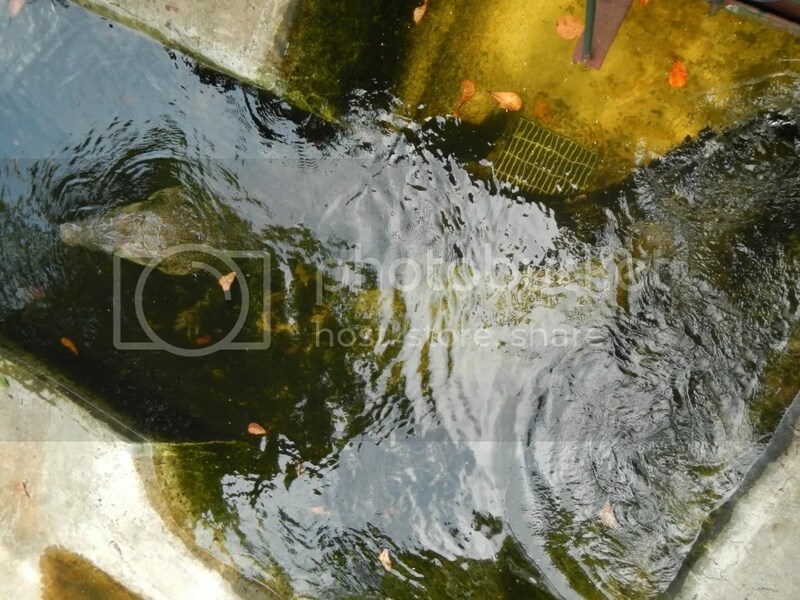 And of course, you were also excited to see monster crocodiles that lurk under seemingly calm pools of water. The allure of deadly, armored crocodiles has stayed with us since our childhood. The last time I saw a live crocodile was in high school when we had a field trip in Cebu Zoo. The croc was not moving at all, and it looked sick. As time passed, we settled on killer crocodile movies such as Rogue, Black Water, and Primeval where we can see giant crocodiles. Then recently, we read the headlines about Lolong, the longest crocodile that was ever captured, and his sad death. 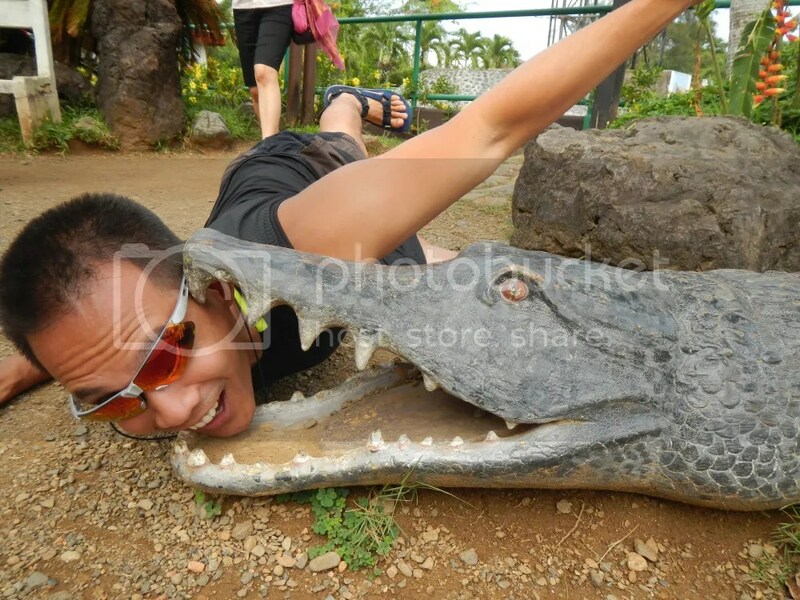 Finally, we had the chance of seeing live crocodiles during our Palawan Anniversary Adventure. 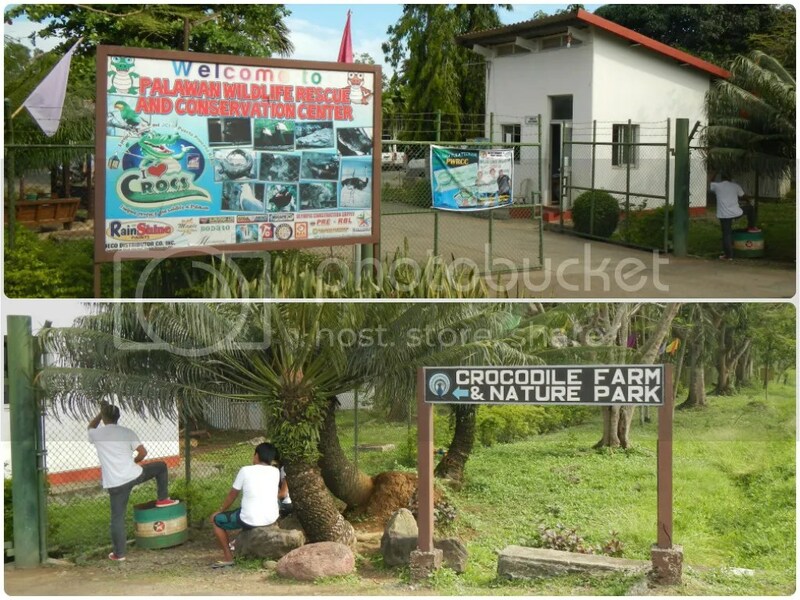 One of the city tour destinations in our list was the 8-acre Palawan Wildlife Rescue and Conservation Center (PWRCC), formerly called, Crocodile Farming Institute. 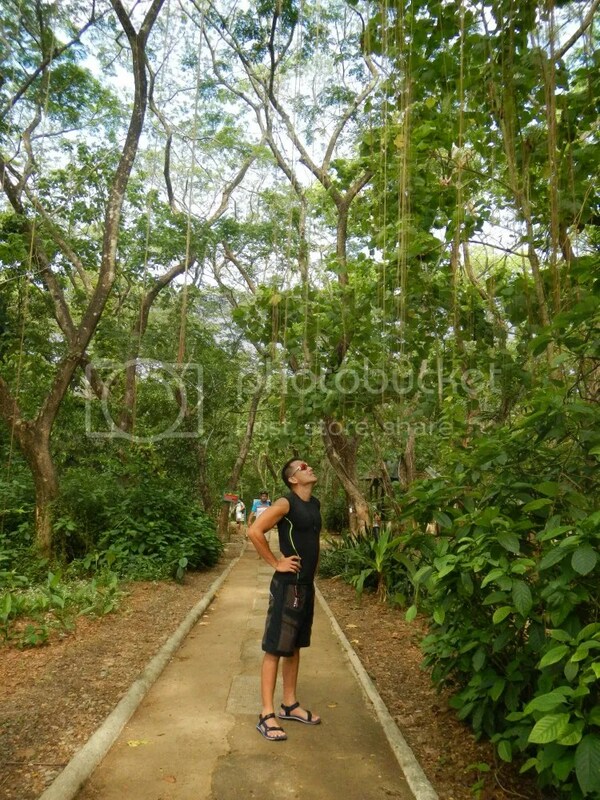 Sir Jhun, knowing that we love trekking, told us that there is a mini-forest inside the facility where we can hike. From the Palawan Special Battalion World War 2 Museum, we proceeded to the PWRCC, which was a 40-minute ride away from Puerto Princesa City proper. While underway, we were amazed at how virgin this place is and how effective the eco-tourism efforts of the city are implemented. 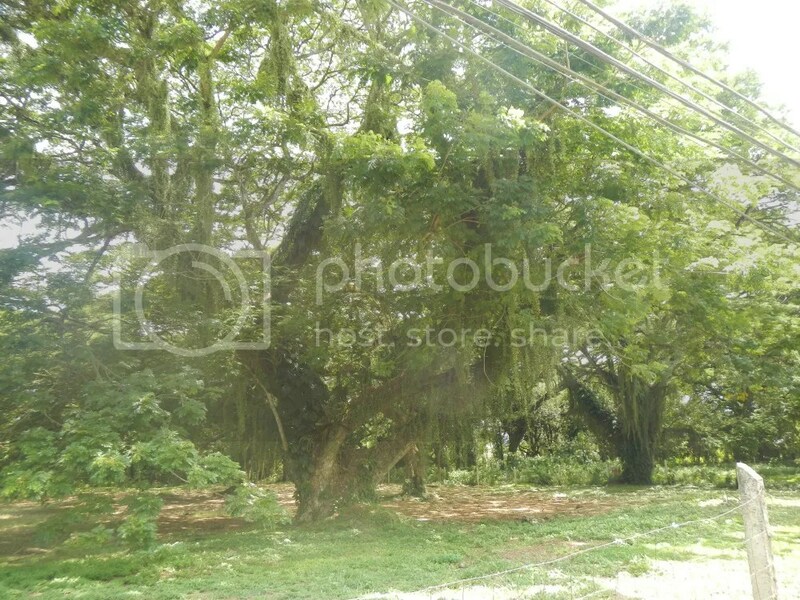 Look at these century-old Narra trees just beside a very busy road. As we turned left to the National Road leading to Barangay Irawan where the facility is located, we saw this proud sign. 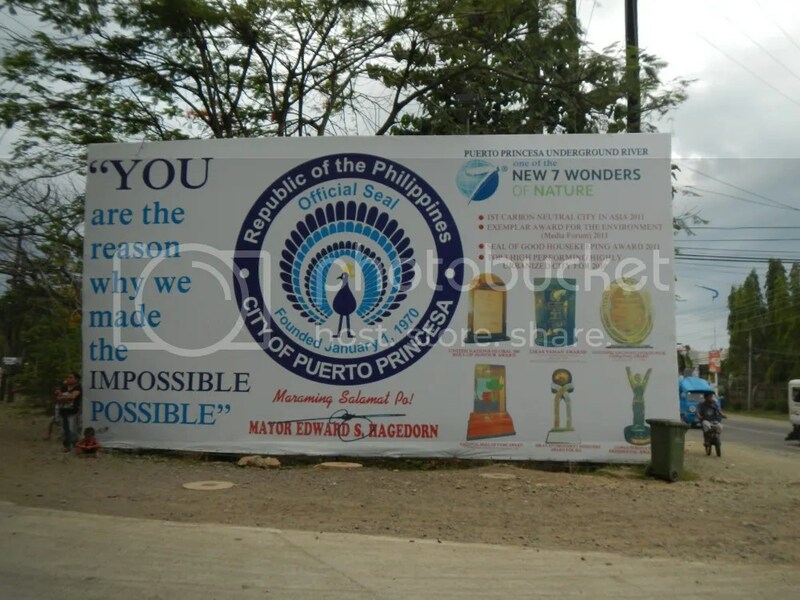 “YOU are the reason why we made the impossible possible.” Mayor Hagedorn was right. Before, Palawan was just a mere speck in the Philippine’s tourism radar. Today, the province is poised to take the country’s tourism crown thanks to the supportive locals, massive advertisements of tourist sites, organized tours, affordable accommodation and food, and many other factors. 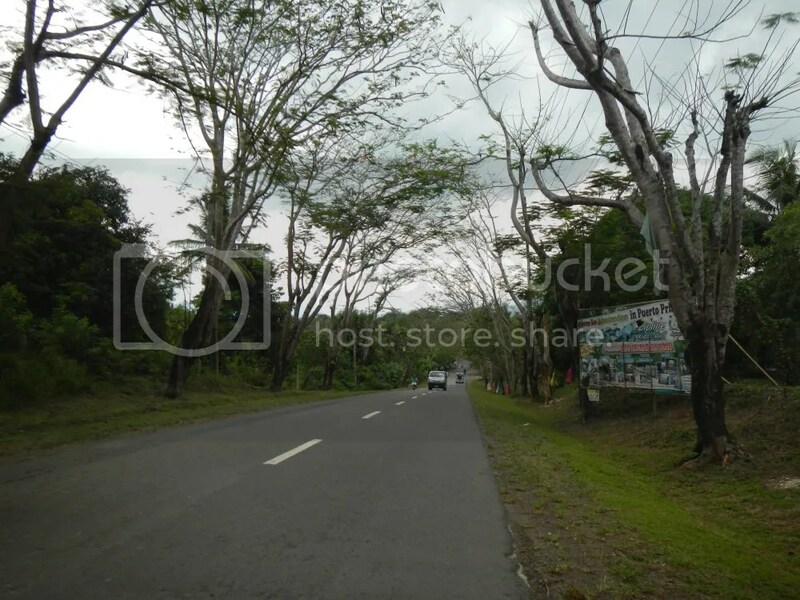 That’s the National Road to PWRCC. Look at the harmony of nature and urbanization. It’s simply amazing, and this proves that a balance of urban development and eco-preservation is indeed doable. In addition, check out the infrastructure. Palawan has an excellent network of paved highways that makes world-famous tourist sites easy to access even if the sites are far apart from each other. After a 40-minute ride, we reached the PWRCC. If the facility is part of your tour package’s itinerary, you will most likely arrive here by van. You can also hire a van to get here if you are with a group of family and friends (a regular van here can sit 12 people). If you’re on a budget, or if there are only 2 to 4 in your group, or if you’re travelling alone, you can hire a tricycle from the city to get here. Just haggle with the driver; P150 to P200 is a good benchmark since this place is quite far. A nicely manicured garden welcomes PWRCC’s visitors. 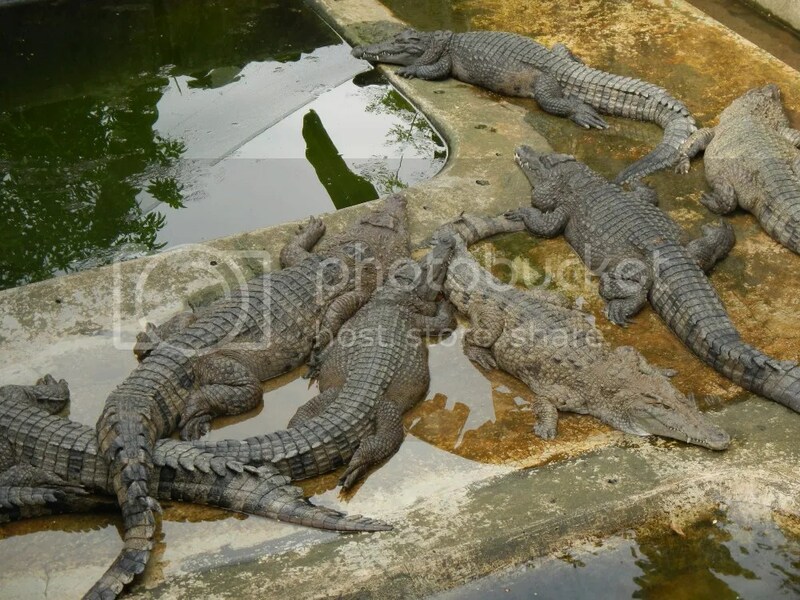 With the help of Japan International Cooperative Agency, PWRCC was established in 1987 as Crocodile Farming Institute. 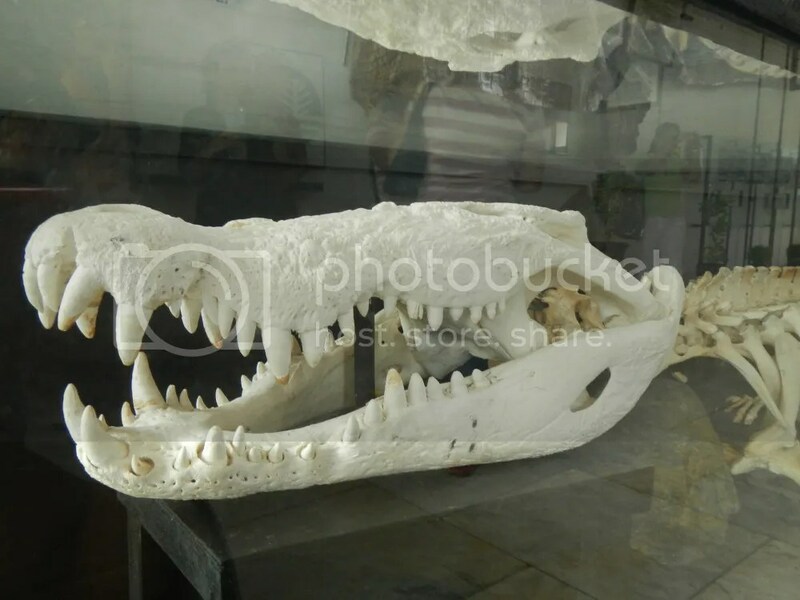 The facility was meant to conserve two species of crocodiles: the saltwater crocodile and the Philippine freshwater crocodile. 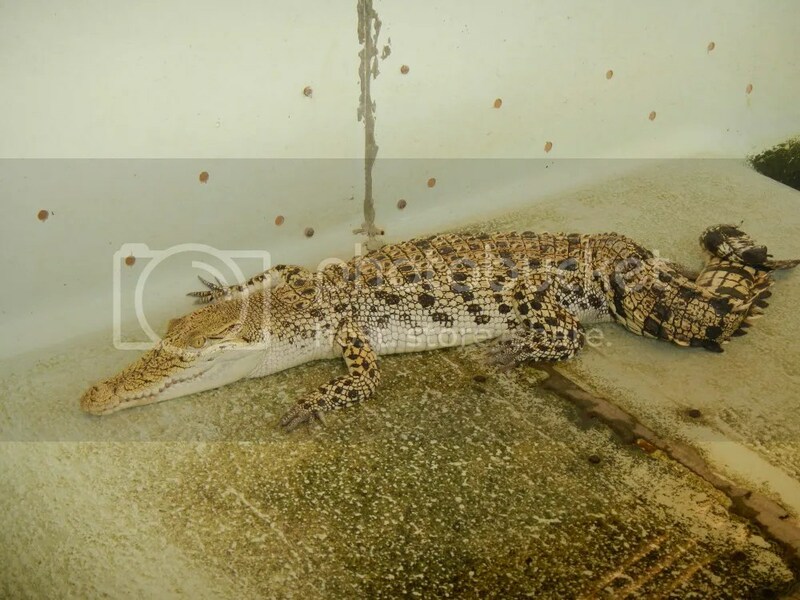 The facility was also made to provide Palaweños with livelihood, particularly developing products that utilize crocodile meat and hide. A strong typhoon in 1998 caused severe flooding in the area. This allowed several crocs to escape into a nearby river. Today, the facility extended its objectives and duties to caring for and preserving endemic and endangered animal species. 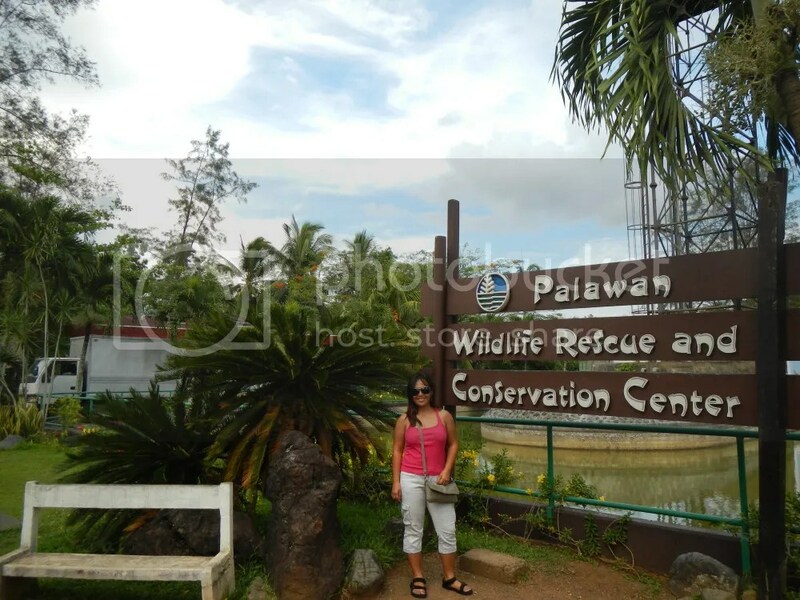 Thus, its name was changed to Palawan Wildlife Rescue and Conservation Center. PWRCC always receives a lot of visitors, especially on weekends. Thus, visiting the crocodile facility and the nature park may be done in batches. While waiting for your turn, you can rest in those cool gazebos or grab a bite in their cafeteria. Across the outdoor waiting area is a spacious parking lot filled with tour vans, private vehicles, and tricycles. A water tower and a large reservoir encircled by an oval road are the most prominent features that are first seen by visitors. We think there used to be a water feature here, but they seemed to have been turned off during our visit. Help! Can’t . . . get . . . free . . .Hehehe! No, that’s not a real crocodile. That’s just a skillfully painted concrete sculpture of a croc. 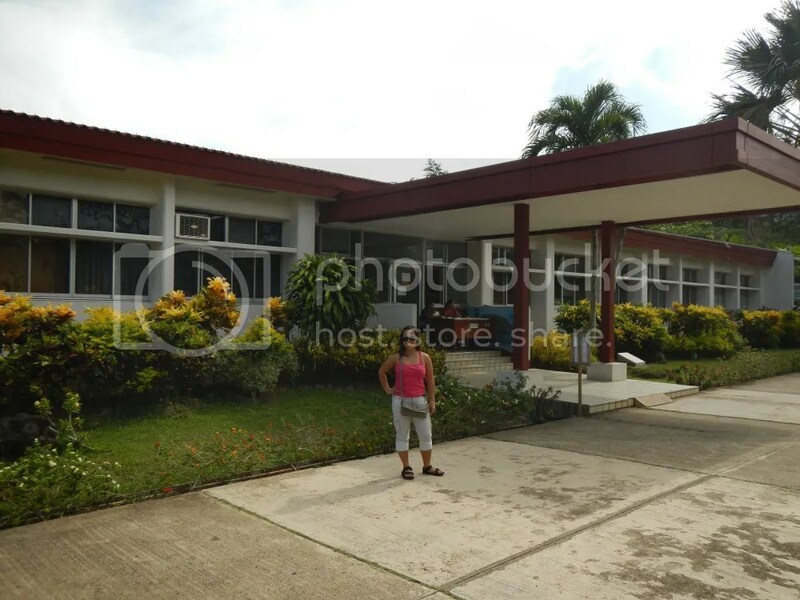 That’s the reception center where all guests register and pay the entrance fee. The reception center also houses the laboratories, offices, libraries, and meeting rooms of the facility. After registering and paying the fee, guests are ushered in the welcome hall where a PWRCC guide give’s the guests a briefing before the tour proper. Immediately, you can see this long, huge, fearsome skeleton of a crocodile. Above it is the armored skin of the crocodile. We wouldn’t be surprised if you’re shocked at the sight of the creature; we never knew crocs could reach such size and length. This one is 17 feet long! That’s longer than a large SUV! Check out that enormous skull and those sharp conical teeth! 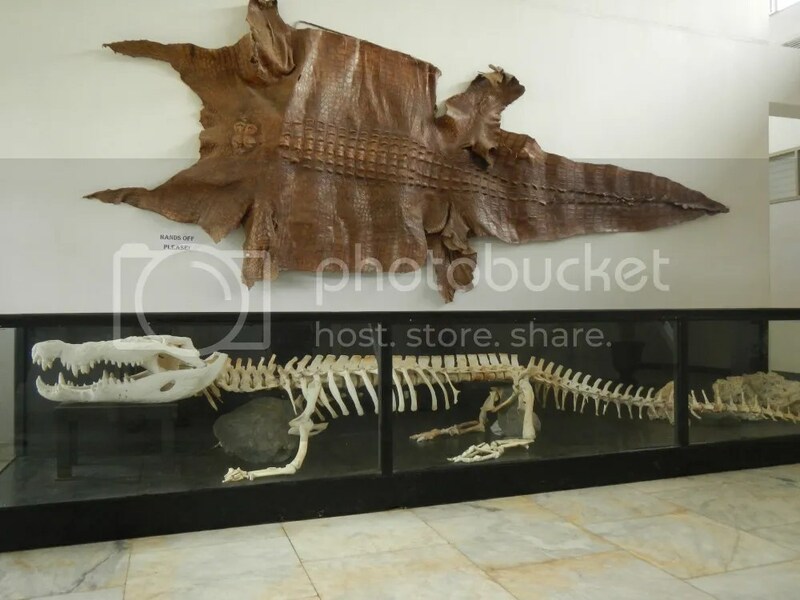 According to the guide, the skeleton and skin on display belong to Rio, a 67-year-old saltwater crocodile captured somewhere in Palawan. Rio was thought to have devoured a farmer. He was captured and given proper care in the facility. But the stress of captivity took its toll, and Rio died a couple of years later. The waters around Palawan also teem with cetaceans such as porpoises, dolphins, and whales. 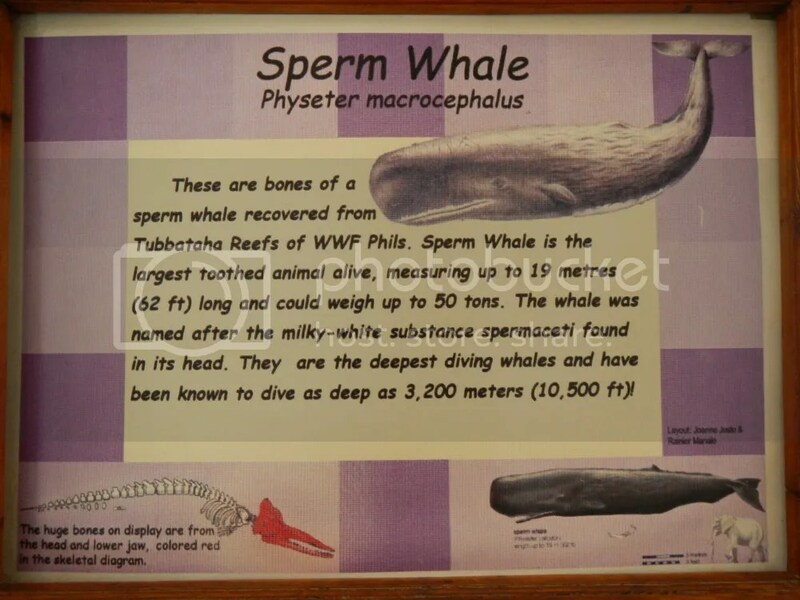 There have been sightings of massive, deep-diving sperm whales off the Palawan shores, particularly in Tubbataha Reef in the West Philippine Sea. Now, check out the lower left of this photo. Yes, that’s the skeletal diagram of a sperm whale. Now, take note of the skull, which is colored red in the diagram. 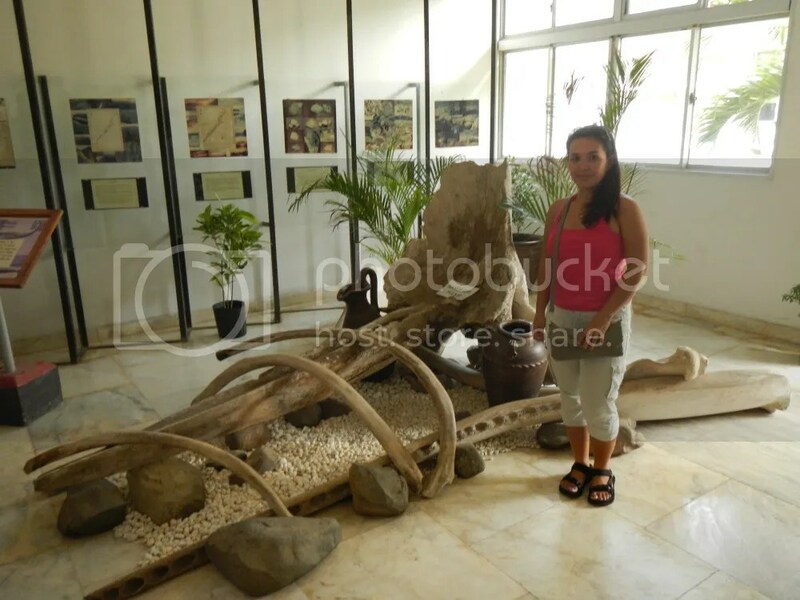 Sweetie posed at the side of a sperm whale’s skull to give you an idea on just how massive this majestic animal is. After seeing this colossal skull and the terrifying skeleton of Rio, you will suddenly realize that there are bigger powers out there—the powers of nature—people can never comprehend. You will realize that we, people, are not special; and we are simply organisms that are under the mercy of Mother Nature. After the briefing, the guide leads guests to the crocodile breeding pen at the back of the facility. The conservation center is just an open-air facility with crocodile pens. When the crocodile reaches 5 years old, such as this 3-foot one, it is harvested for its meat (to be made into crocodile food products) and skin (to be made into belts, wallets, and shoes). Contrary to popular belief, the skin of big, old crocodiles cannot be made into croc-skin products. That’s because the skin becomes extremely tough, hard, and impossible to cut. Big, old crocs, therefore, are used to breed baby crocs, released into the wild, or kept in a zoo. 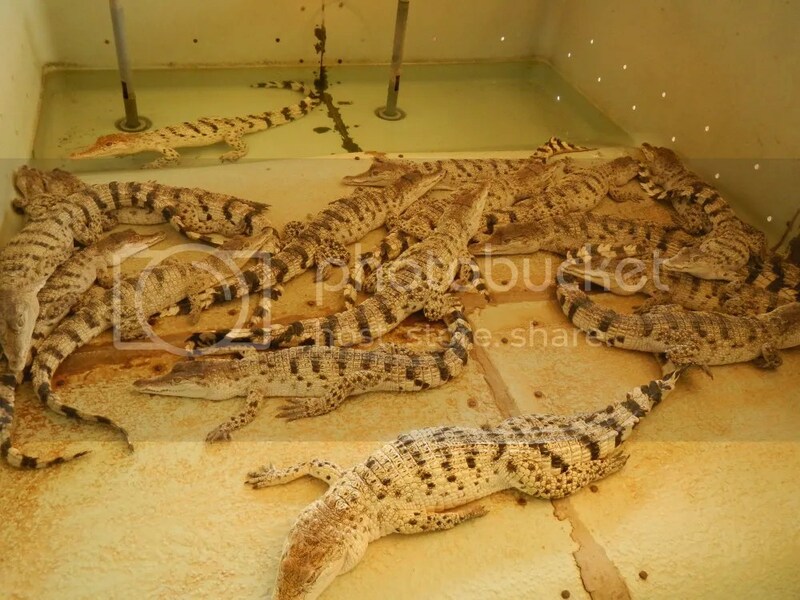 Dozens of young crocodiles are kept and taken care of in a pen. Be careful! Don’t put your hand in the pen. These crocs, even at a young age, are very aggressive and amazingly strong. With their sharp teeth and extraordinarily strong bite force, one of these animals can chomp off your finger or hand easily. After touring the breeding pen, we were led to a steel sky bridge in the middle of various pens. Yes, these pens house the big crocs, the ones that can truly kill and eat anything, including a person. These pens hold adult crocodiles such as these. Each of powerful crocodiles is as long as a car. We felt the hair at the back of our spine stand out at the sight of these powerful, deadly creatures. Crocodiles hunt and feed by grabbing and holding onto their prey. Thus, through millions of years, they developed sharp for piercing meat and unusually powerful jaw muscles to hold the jaws shut. Strangely enough, the muscles for opening the jaws are very weak; several straps of duct tape can hold the mouth shut. Take a look at those awesome crocs just below us! And take note, each one is nature’s machine bred for killing! So you have to be careful. If something falls in any of these pens, it will never come out. Can you imagine if those flimsy looking brace or fence fails? Can you spot the giant croc? That’s Mac-mac, the resident star and the largest crocodile in captivity in the farm. Mac-mac is a monster 17-foot saltwater crocodile. Remember Rio? He’s 17 feet too! As a huge crocodile, Mac-mac must have a bite force of thousands of pounds of force and sharp conical teeth to hold his prey down. Any prey that tries to escape will tear itself in half. Here’s another view of Mac-mac. Needless to say, anyone or anything that shares the same cage with him will become his breakfast. It’s reassuring to know that, according to the guide, they feed Mac-mac and the rest of the crocs with cow, pig, or chicken carcasses. Yes, live animals won’t be fed to the monster. Animal rights advocates can then breathe a sigh of relief. Unfortunately, he didn’t get out of the water so we could shoot a better photo of him. It’s either he just wants to cool down on a hot summer afternoon or is actually hunting. Hunting? Yes, crocodiles hunt by submerging themselves in water, with only their nostrils and eyes jutting out of the water. If an unlucky animal happens to be near the water—to take a drink, for instance—the crocodile lunges, holds on to the prey, and drags it under the water. 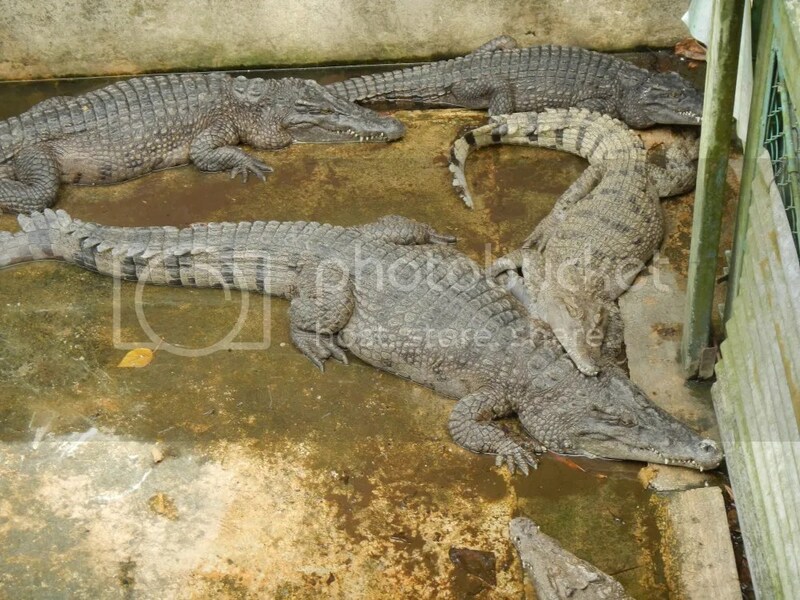 Pens that hold Philippine freshwater crocodiles are separated from the ones that hold saltwater crocodiles. An informative data board defines the differences between the two species. 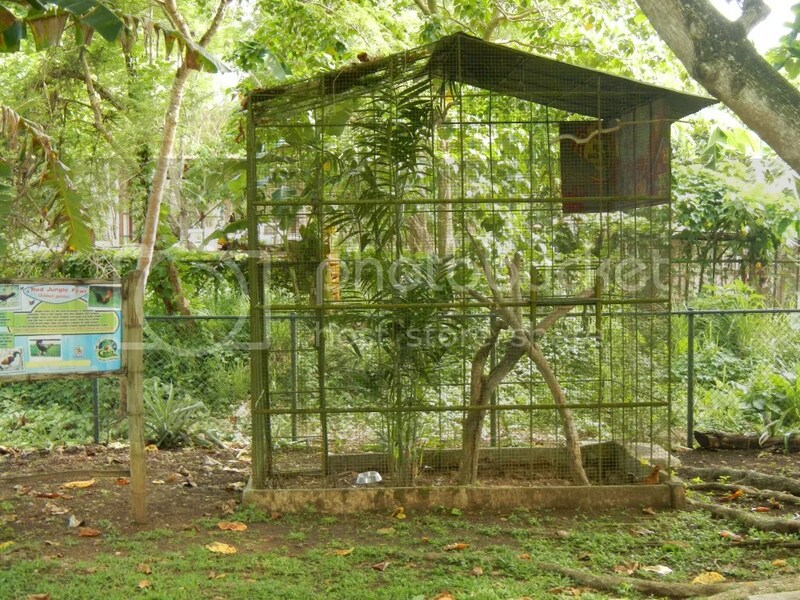 Along the way are aviaries that house indigenous Palawan birds and common birds in the Philippines. 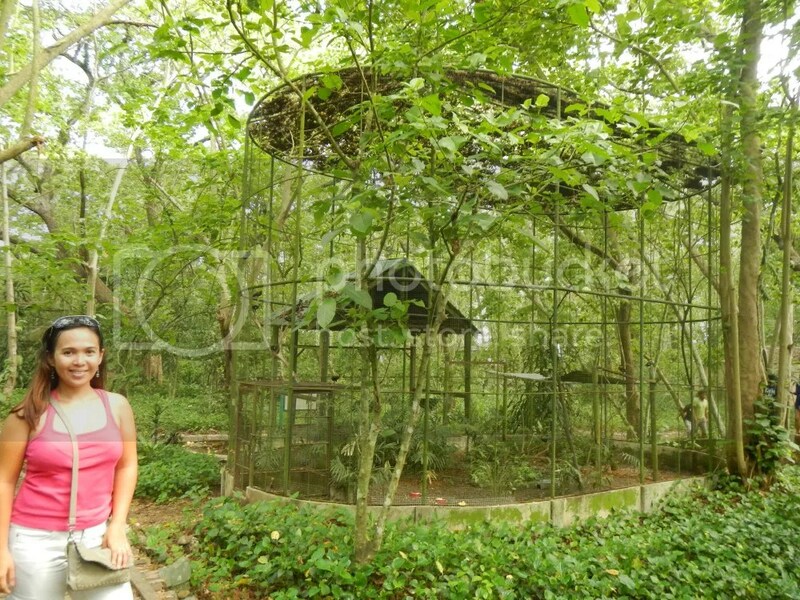 The aviaries are quite spacious, giving birds large spaces for flying. There are several animals other than crocodiles that are kept in PWRCC. 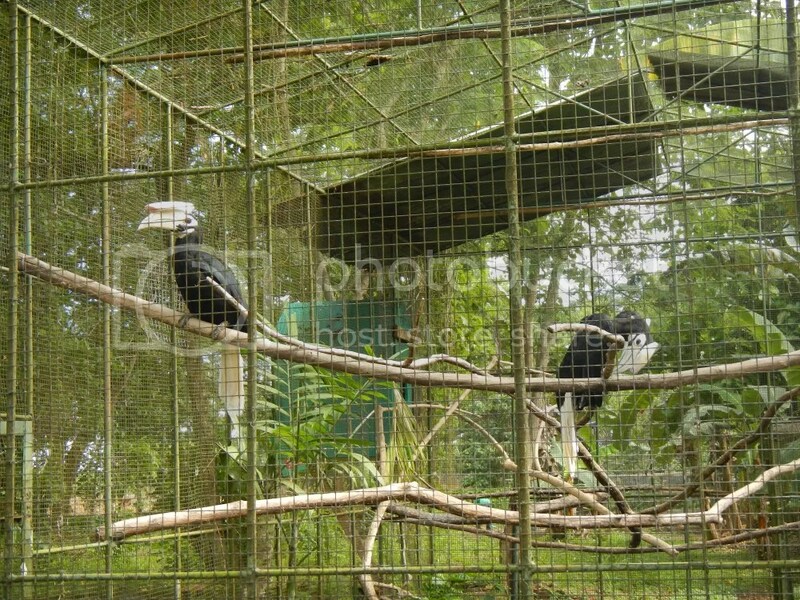 Examples of such animals are these Palawan hornbills. They’re truly amazing birds. We love that bony crest above their gigantic beaks. Information boards such as these provide valuable and entertaining data about the animals in captivity. 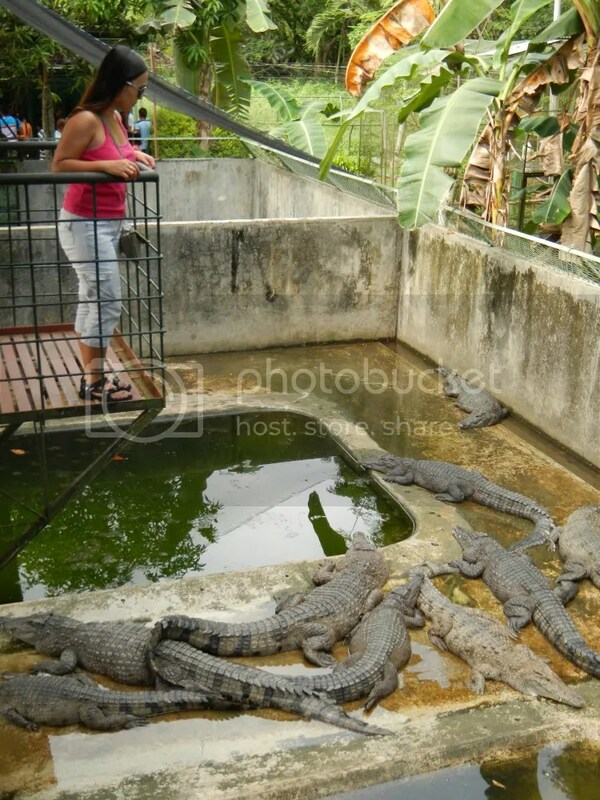 The crocodile farm is the facility’s main attraction. 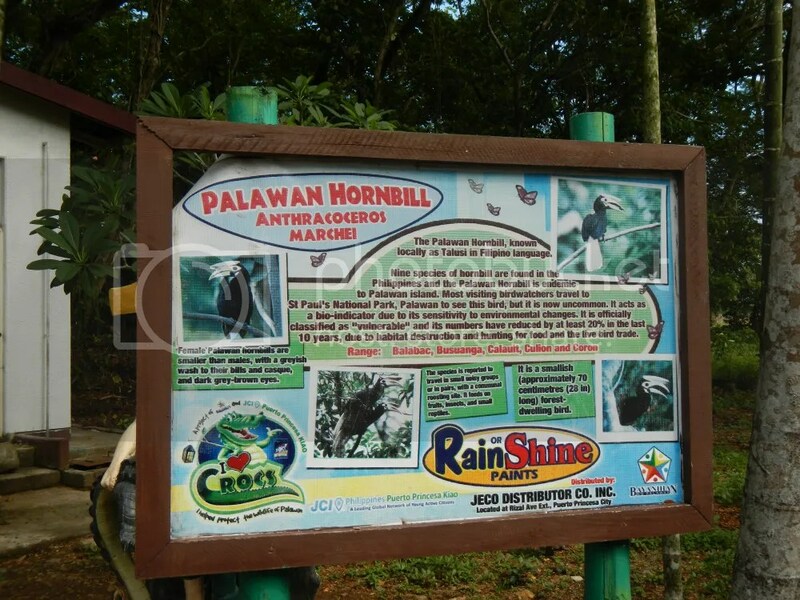 However, PWRCC also has a nature park, a 4-hectare wooded area filled with various species of flora. It also houses several interesting animals. Technically, we viewed it more as a zoo than a natural park. 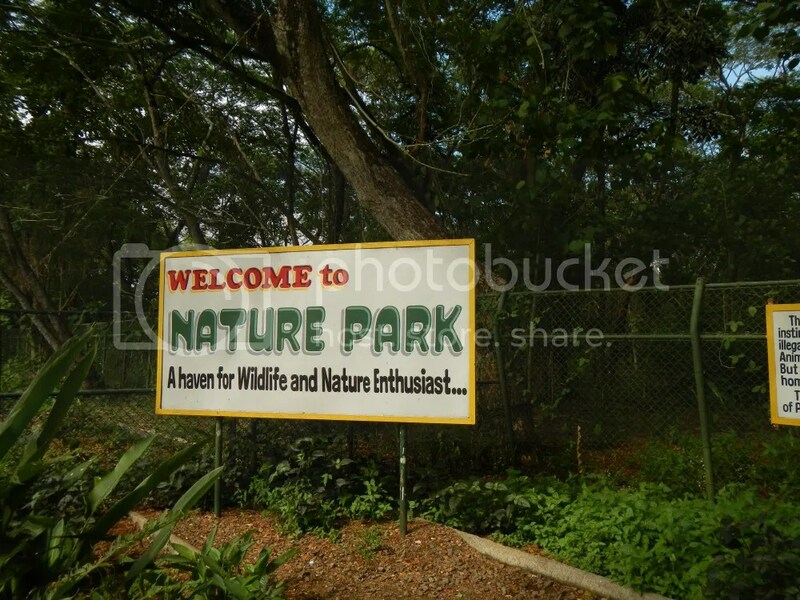 That’s the entrance of the nature park. From here, it is evident that the place is left to grow “wild,” with just human intervention to make the park safe and enjoyable for tourists. Which way, Sweetie? Yes, there are lots of man-made trails in the park. No worries. You won’t get lost. Just refer or take a photo of this map to help you navigate around the park. Several auxiliary signs also exist around trail crossings. 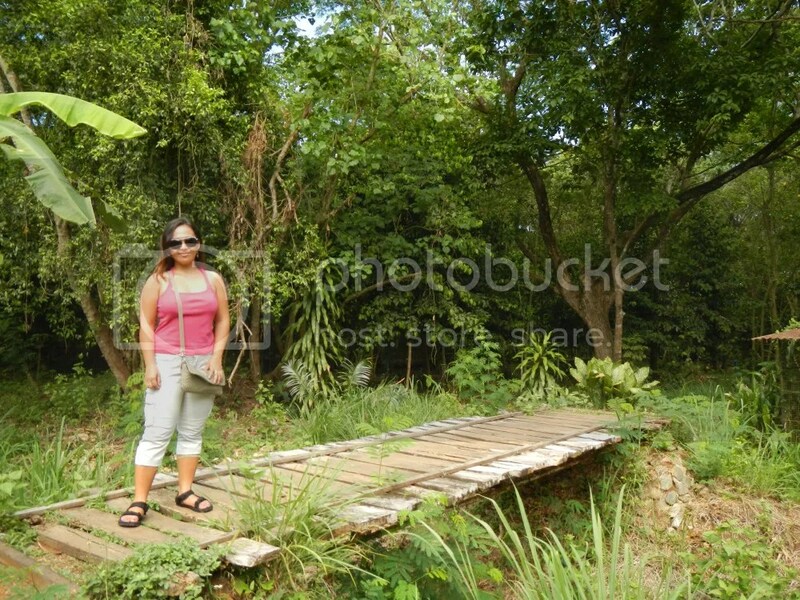 You may come across rickety wooden bridges like this one. It’s pretty cool as it creaks every time you step on it. Large aviaries such as this are established around the park, so are pens for the animals that are indicated in the entrance’s signs. Unfortunately, we haven’t seen a porcupine, wild pig, and other any mammal indicated on the signs at the park’s entrance, so we decided not to take photos of their pens. Perhaps they’re hiding? What we saw are just the avians. 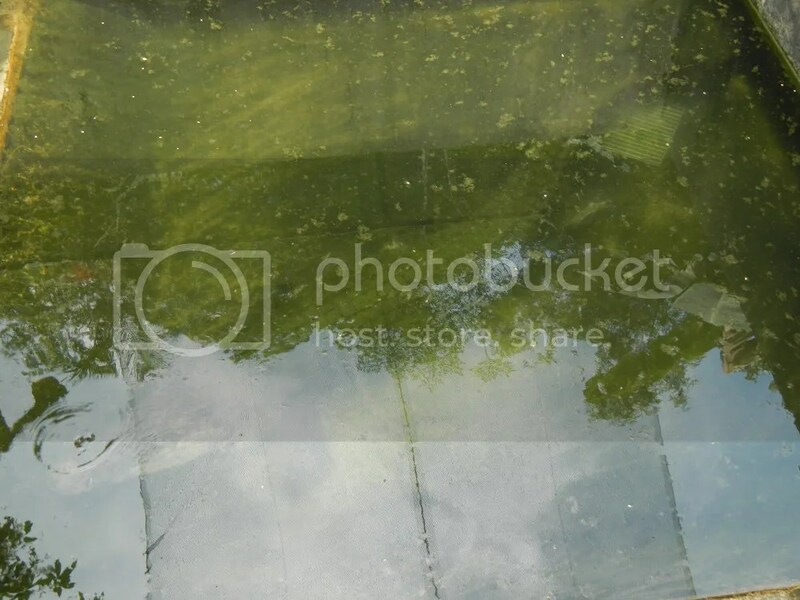 The reptile house is dilapidated and devoid of reptiles except for a small, unmoving python inside a glass cage. You’ve probably seen pythons elsewhere (those mananambals stationed in Cebu’s Carbon have pet pythons). 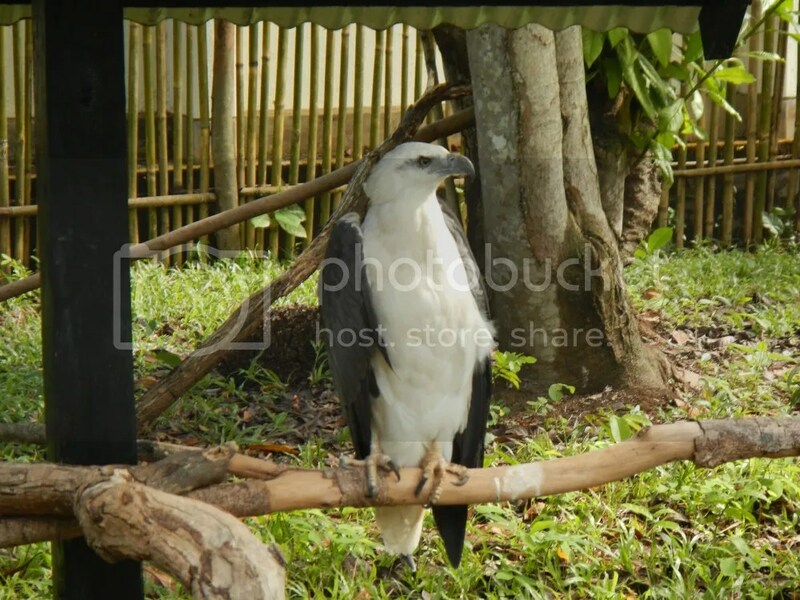 A splendid white-belied sea eagle sits majestically in his shelter. Look at those wicked, powerful talons and sharp beak. One look and you can see why these magnificent birds of prey are masters of the coastline. Because it lives near the sea, a white-bellied eagle usually feeds on fish and small mammals. After 45 minutes, we’ve seen enough of the park and walked back toward the exit. As we went along, we admired the beautiful, large-canopied trees that towered over us. 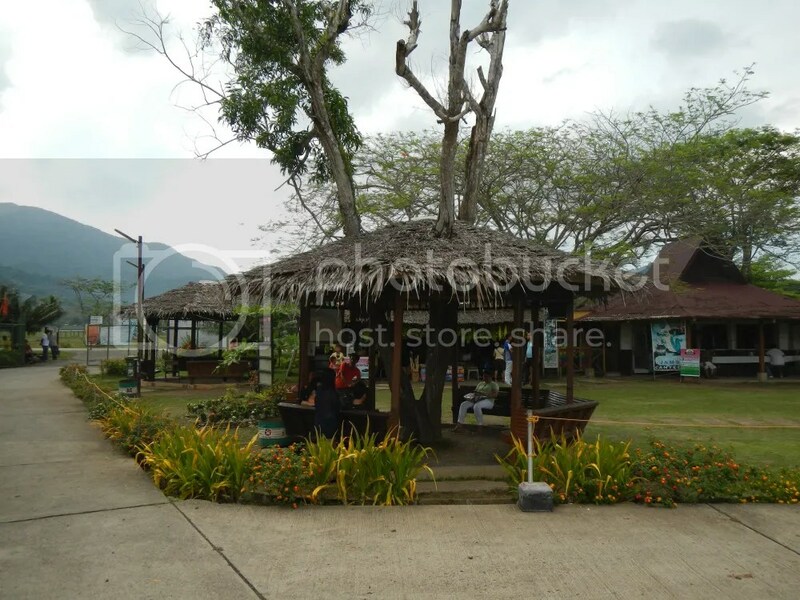 You can buy PWRCC souvenirs in that hut. However, know that buying, smuggling, trading, hunting, collecting, or possessing live wildlife and their by-products is strictly prohibited. Violators are dealt with severely. Even if they look cute or exotic, wildlife should remain in their homes, the wilderness. On your way out, you can have your photo taken with this friendly bearcat named Ella. Boy, was she heavy! And a little bit smelly too! Ella the bearcat belongs to a rare class of viverrids that are indigenous to South and Southeast Asia. Hunting, habitat degradation and loss, wildlife trade, and other man-made holocausts have eliminated many bearcats. Today, these gentle omnivore mammals are listed as “vulnerable” in the conservation status chart. In Malaysia, bearcats are critically endangered. 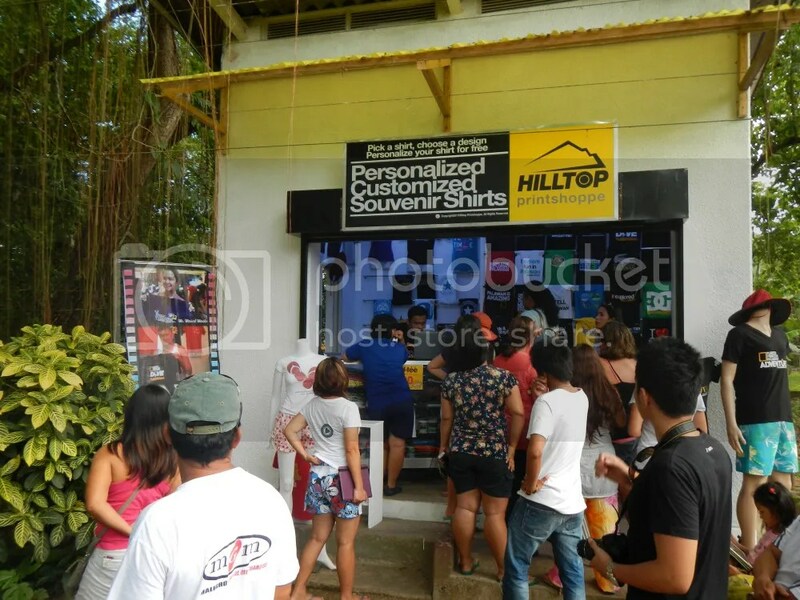 After your visit at the PWRCC, you can buy a souvenir shirt and have it printed with a logo and a cool caption that you’ve survived your encounter with Palawan’s mighty crocodiles and beautiful wildlife. 1. 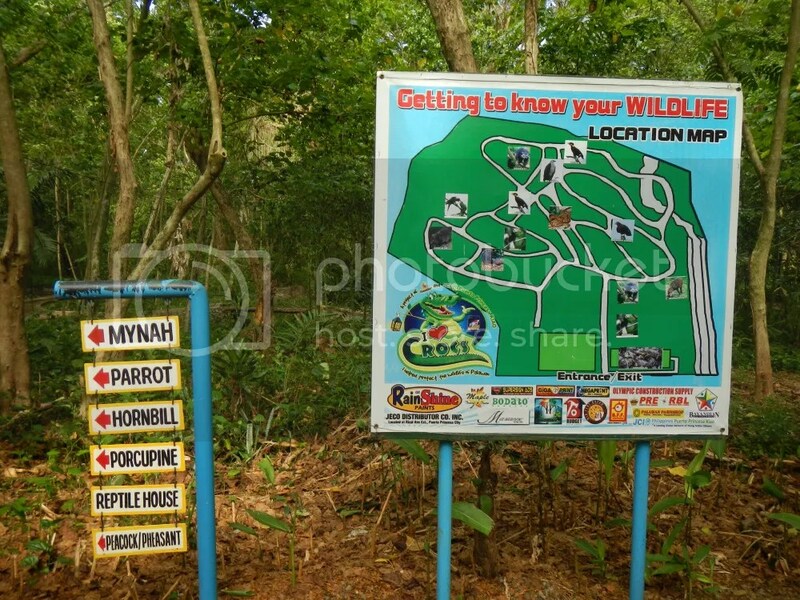 The Palawan Wildlife Rescue and Conservation Center can be reached via hired tour van, private vehicle, or tricycle. In the case of the tricycle, you can simply ask any tricycle driver to take you to PWRCC. Remember that this is a 40-minute ride from the town center, so negotiating for a fair price is the norm. 2. 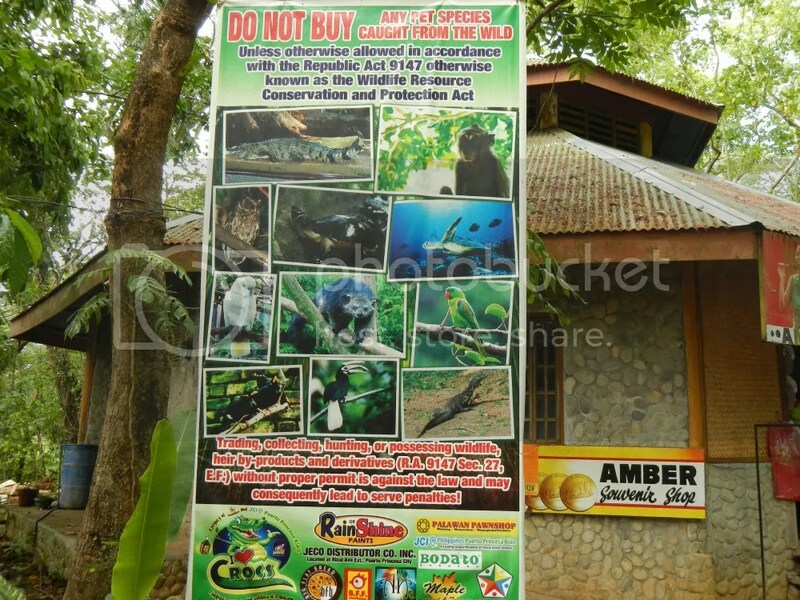 The Palawan Wildlife Rescue and Conservation Center is located in Barangay Irawan, Puerto Princesa City. It’s just beside the national road. Most locals know where it is. You can also contact them at +63(2)9296626. 3. The Palawan Wildlife Rescue and Conservation is open Monday to Friday at 9AM to 12 noon and 1PM to 5PM, and 1PM to 5PM on Saturdays. If you wish to see the crocodiles being fed, go there on Monday and Thursday afternoon. 4. Registration fee is P35. 5. Don’t ever put your hand into the crocodile pens! Not even the baby croc pens. Crocs are attracted to movement, and your hand can definitely be seen as food. You don’t want to go home less a few fingers, do you? 6. Secure everything on you when you visit the crocs in the big pens. Once something falls in the pens, it can’t be retrieved unless someone foolish or brave enough wades into the crocs’ lair. 7. The guided tour ends at the crocodile pens. 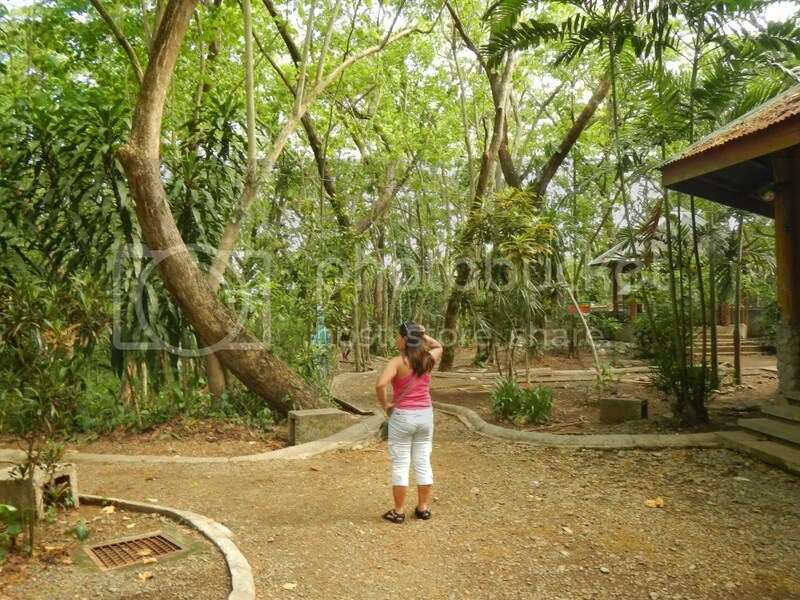 The rest of the place, including the nature park, is self-guided. Don’t worry, you won’t get lost. The pathways and trails are very clear, and there are signs everywhere. 8. 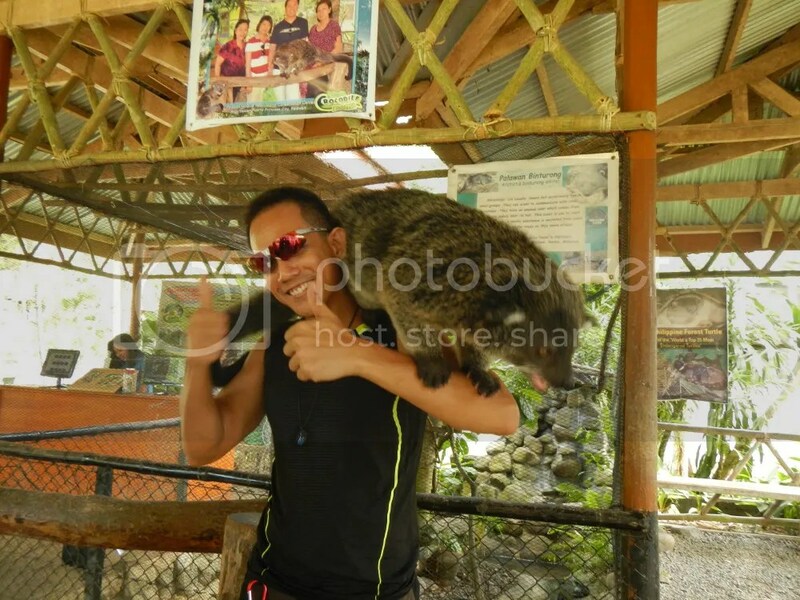 You can have a photo taken with a baby croc (the snout is taped so it couldn’t bite you) and/or a fluffy bearcat. Price for the shoot is P30 for the baby croc and P20 for the bearcat. If you wish to have your photo printed, you would need to pay P200 per photo. 9. Do not give food to the animals even if you see PWRCC staff feeding them. Remember that the staff members are trained personnel, and they follow a proper feeding schedule. If you feed the animals yourself, you face the risk of being attacked and injured. Worse, you alter their feeding patterns. wow! this is a really good tourist destination. Thank you! 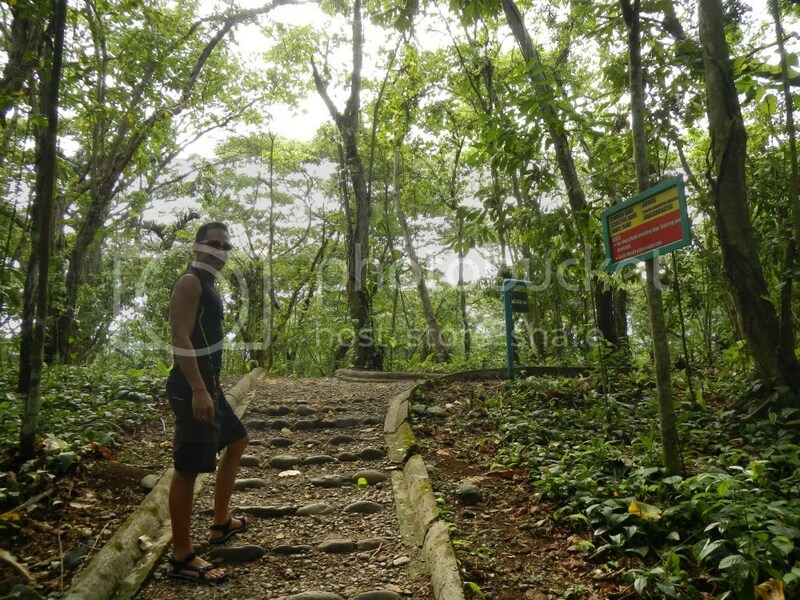 It is one of the must-visit destinations in Puerto Princesa, especially if you love wildlife and nature. We’re sure you won’t be disappointed. until what time are they open? Upon arriving on Friday, you may want to check out Binuatan Creations for a close-up look at Puerto Princesa’s weaving industry. Next, you may want to visit Plaza Cuartel and the Immaculate Conception Cathedral. Last stop for the day will be the Baywalk to catch the sunset and take a leisurely stroll. For dinner, head out to Kinabuchs Grill and take the tamilok challenge or try out their famous crocodile sisig. On your last day, you still have enough time for a quick visit to Baker’s Hill. Just make sure all of your bags are packed and ready. Baker’s Hill opens at 9AM and it’s a 30 to 45 minute travel from the city proper. After visiting the themed park, visit their pasalubong center for yummy pastries and bread. Be sure to buy their best-selling hopia and cashew nuts. By 10AM, you should be on your way to the airport to catch your flight. Hope this helps. 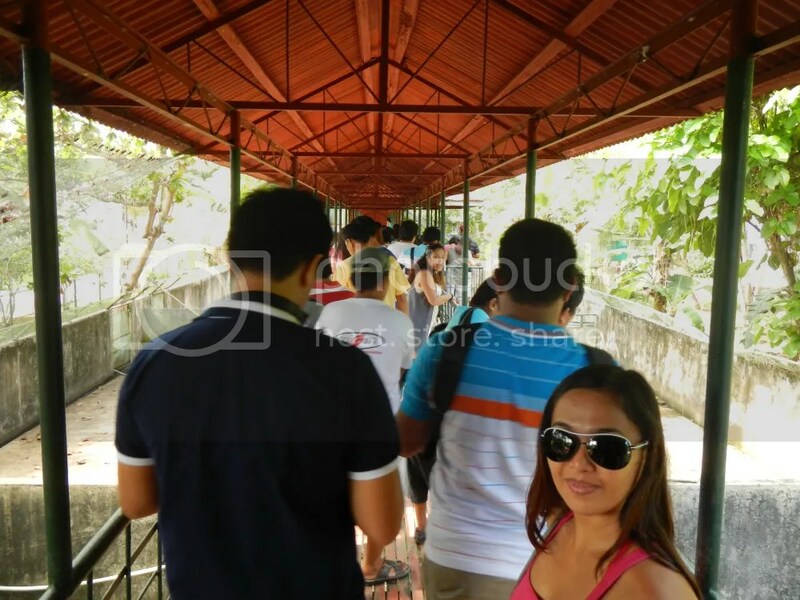 Thank you for dropping by our blog and enjoy your trip! Let us see; on your first comment, we are assuming your entire Saturday is for the PPUR tour. 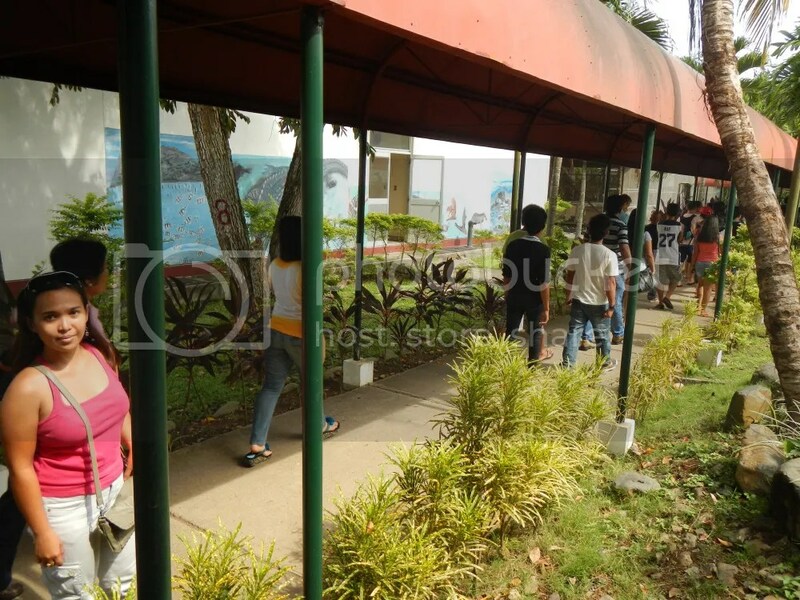 Based on our experience, we think you can visit the PWRCC after the tour if you leave Sabang early, right after lunch. We suggest you arrange with your provider to pick you up at your hotel early (if possible, at 5 AM) so you can have early dibs on the PPUR tour. If you leave after lunch, chances are, you will arrive in Puerto Princesa at around 3PM, which gives you extra time to visit the PWRCC. You’re welcome, and thank you for 1) getting in touch with us and 2) complimenting our humble blog. Readers like you inspire us to travel more. 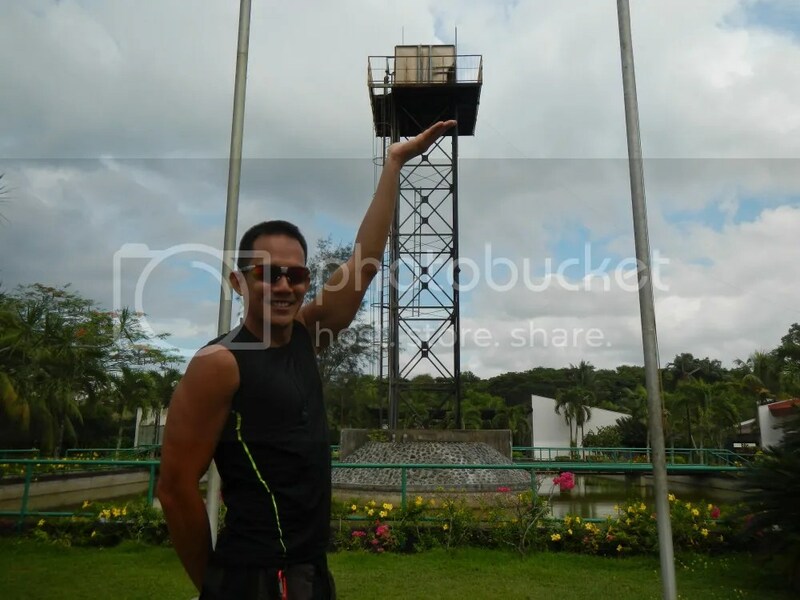 We will definitely visit Region 8 soon; we are eyeing to climb a mountain there called Tres Marias. Hehehe! Sure, no problem at all. Thank you very much!